Originally designed as an infantry tank version of the A9, but with bolted on thicker armour, this vehicle was re-classified as a heavy cruiser. The A10 Mark I had the same turret as the A9. Only 13 were built. The Mark IA had a modified mount for the main armament. The vehicle was used by the BEF in Normandy and saw action at Tobruk in 1941. It suffered from poor cross-country performance and was rather slow. All the pictures on this page are of the CS (Close Support) version with 3.7 inch howitzer which is on display at The Tank Museum, Bovington. The standard vehicle was armed with a 2 pounder. Special features/remarks: As A9. 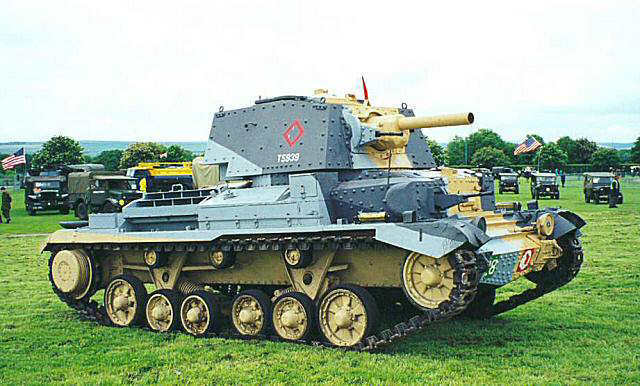 First British tank with composite armour construction. 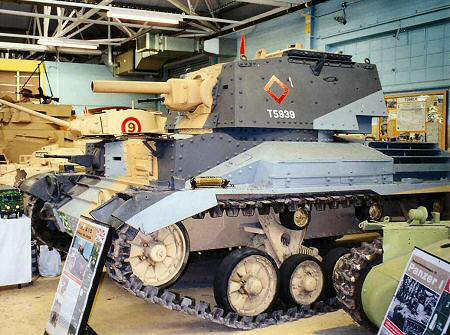 Mk IIA was first British tank to be armed with the Besa MG.